Launching a business from home can provide tremendous flexibility and the kind of work-life balance that we all crave. But the reality is that home businesses bring their own set of challenges, says Caroline Daniels, lecturer for entrepreneurship and technology at Babson College in Wellesley, Mass. For example, "doing your business on your own from home can get stale. It's hard to keep feeding the imagination all on your own." Keeping a 24-7 Work Schedule: When Leon Oks co-founded iCanvasART, an online seller of custom canvases, he and several employees spent day and night working from his dining room. It's a recipe for burnout. "You're feeling guilty that you're not working, and there's no disconnect," Oks says. Eventually, he asked employees to leave by 6 p.m. and made sure to schedule free time into his day. But this year, he moved his Niles, Ill.-based company to an office space because the growing business was becoming difficult to manage at home. Allowing Interruptions: Without a boss breathing down your neck, it's easy to take a phone call or two from family and friends. But when you're constantly in "interrupt mode," it hurts your business focus, Daniels says. To combat disruptions, she recommends setting aside blocks of quiet time throughout the day when you don't allow phone calls or email alerts. 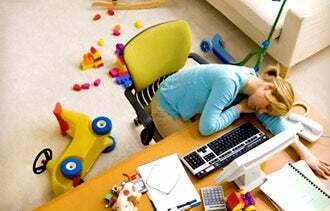 You also need to be careful about getting pulled too often into distracting chores like laundry or childcare. Remind family members and babysitters of your work hours and explain you'll be answering only urgent requests. Depending Too Much on Loved Ones: Without coworkers around, you can easily fall into a habit of talking out your business problems with your spouse or friends. But loved ones may get weary of talking about your business. What's more, they may not provide the best advice because they don't always understand your business, Alexander says. So, try to connect with others in your field to develop an informal network of advisors. "Build a mastermind group of others with home-based businesses," Alexander suggests. Failing to Create a Separate Work Area: Even if you don't live in a huge home, set aside a space reserved almost entirely for work. Opt for a little-used room or even an empty corner of your living area to create a physical divide between work and home. If you must work in a common area of the house like the dining room or kitchen, put away personal objects to set a professional tone for the day, Daniels says. "Even if you don't have a separate space, you can create it." Letting Employees Abuse Your Home: You risk damage to your home if you don't establish rules for how employees should behave there. For example, Oks got stressed out over how his workers would eat lunch in his living room, walk on his light-colored carpet with their shoes on, and tack notes onto the walls. Instead of scolding employees later, it's better to set expectations from the get go, Oks says. "Set up rules you're comfortable with." Oks began asking employees to take off their shoes and clean off their workspace at the end of the day so he could use his dining room table each evening. Getting too Busy to Stay Organized: As work piles up, it's easy to let organization slide, says Tata Harper, who started an eponymous skincare line at her home in Shoreham, Vt. "It is easy to succumb to disorganization when you are working in the same place that you live since it is a private space that you don't often share with" coworkers or other visitors, she says. Harper files papers away before they pile up and stores only business-related items there. In addition, she finds that decorating and brightly lighting her office motivates her to keep it clean. Starting the Day Without a Plan: "Without conscious decisions about how to spend your time, your day can slip away without much to show for it," says Elaine Quinn, Chicago-based author of There's No Place Like Working From Home (Calloran Publishing, July 2011). Instead, give time to both short-term actions and long-term goals so you run your business in a more balanced manner. Create a schedule and stick to it. "Rather than making to-do lists, enter tasks directly into your [daily] planner," which allows you to set a specific deadline for completing each task, Quinn says. Also, make sure you leave unscheduled time in the day to deal with important but unexpected issues that crop up.